of Stonington and North Stonington m.
of Stonington and Voluntown m.
(1731 – 1801) of Stonington and Brookfield m.
The Palmers are hard to disentangle as they were prone to marrying each other. Names of spouses are printed in the same colour in the chart below. Imprimis. I give unto my son John a yoke of three years old steares and a horse. Item, to my daughter Grace twenty shillings. Item to all my grand children twenty shillings apeece. Item to my Sonne Jonas halfe the Planting Lott at ye now meaddow River by Seacuncke & ye Lott betweene John Butterworths according to the fower score pounds Estate & the use of halfe ye housing & halfe of the whole ffarme for foure yeares. Item, I give to my Sonne William the other halfe of ye same ffarme at Seacuncke forever and to take Robert Martin or some other skillfull man, & divide the housing & the whole ffarme into two equal pts & to take his owne & dispose of it as he pleaseth, I doe give him also a Mare with her foale two redd Oxen, and a paire of Steares of three yeare old apiece, fower lowes & a muskett with all such things as are his own allready. Item, the other halfe of the ffarme at Seacuncke I give to my Sonne Gershom for ever after the end tearme of fower yeares. Item, for all the rest of my Land goods & Chattells undisposed of I leave unto my Loving wife whome & with my Sonne Elihu I make my full executor to pay my debts & to bring up my children & to pay them theire portions as my Lands & Estate will beare, but in case my wife shall marry againe before my Children are brought up & their portions payed them my three sonns Elihu, Nehemiah & Moses to enter upon the ffarme & Estate & to pay unto their mother £10. p. annum during her natural life & ye Land & Estate duly valued to be equally disributed among my Children, Elyhu Nehemiah Moses Benjamin Gershom Hanah & Rebecca with consideration of the tenn pounds yearely to be payed to theire mother out of ye land but if my Loving wife pay theire portions according to theire discretion & my three Sonnes Elihu Nehemiah & Moses possess the Land they shall give twenty pounds apiece out of the Land to my Sonne Benjamin besides his mothers portion, in three yeares after they are possessed of the ffarme. Wittnes hereof I hav sett to my hand the day & yeare above in the presence of WALTER PALMER. Memorandum. That if Elyhu Nehemiah & Moses decease before they hav any yeares Benjamin is to succeed in theire pt of ye ffarme & to give to my daughter Elizabeth two Cowes. Memorandum that I give my Executors a yeares time for the payment of Legacies. At the General Court heard May 11, 1662, the widow Palmer & Elihu by petition of Lieut. Richard Cooke. Court approved of ye will." Grace Palmer was born in 1608-10 or about 1614. She died on 31 Dec 1690 in Stonington. She married Thomas Minor. John signed his will on 26 May 1677. He left his sister Elizabeth £15; he left a bequest to Goodwife Ffosket for her "care and trouble"; he gave 3 pounds each to his overseers, Thomas Welch, Jr. and John Call. He left the remainder of his estate to his brother Jonas, who was also his executor. [Ref, p. 18] Inventory on his estate was taken on 3 Sep 1677: he owned four books, a bible, house lands, a horse and furniture for the horse. Elizabeth received a bequest in her brother John's will of 26 May 1677. Hannah Palmer was born in Charlestown. She was baptised on 15 Jun 1634 in Charlestown. She married first Thomas Hewitt. She married second Roger Sterry. She married third John Fish. Nehemiah Palmer was born about 1636. He was baptised on 23 (9) 1637 in Charlestown. He died on 17 Feb 1717/8 in Stonington. He married Hannah Lord Stanton. Dea. Gershom Palmer was born in 1645. He died on 27 Sep 1718 in Stonington. He married first Ann Denison. He married second Elizabeth (Peck) Mason. Here lyeth ye Body / of Nehemiah Palmer /Esqr; dyed Febry /the 17th 1717 in /the 81st year of / his age. Lieut. Joseph Palmer was born on 2 Oct 1663 in Stonington. He was baptised on 14 Dec 1674 in Stonington. He died on 31 Jan 1710 in Stonington. He married Frances Prentice. Hannah Palmer was baptised on 11 Apr 1680 in Stonington. She died on 19 Jul 1751. She married Capt. Ichabod Palmer. Mercy and John's gravestone says: "In memory of a pious pair this carved stone was erected here, viz., of Mr. John Breed and his wife Mary who lived together in ye marriage state in a most religious manner about 64 years, and then deceased, leaving a numerous offspring; he in 1751 about 90 years of age, and she in 1752 about 83 years. Erected in the year 1772 by six of their children then living. Behold the righteous live long on earth, And in old age resign their breath, They and their offspring here are blessed: When done with life they go to rest." [Ref, p. 48] Click here to see a photo on the Findagrave website. Savage [Ref, 1;241] say, "Mercy, daughter of Gershom Palmer, had numerous offspring and died 1751, if we believe the gravestone, at 90 yrs. old [! ], which seems very probable but the same witness testifies to the married state in a most religious manner about 64 years which is vulgar exaggeration of 3 yrs." Ens. Gershom Palmer was born in 1672. [Ref, p. 49] He was baptised by Rev. James Noyes on 9 Sep 1677 in Stonington. [Ref, p. 49, says 3 Sep][Ref][Ref] He died in 1733/4 in Killingworth, Middlesex, Connecticut. [Ref, p. 50] He married Sarah Fenner [Ref, p. 50] in about 1700 in Stonington or Saybrook. [Ref, p. 554][Ref] Sarah was the daughter of Capt. John and Sarah Fenner of Saybrook. [Ref, p. 50] She died before 1732, when her mother refers to her as deceased. Capt. Ichabod Palmer was baptised on 9 Sep 1677 in Stonington. He died on 10 Apr 1752. He married Hannah Palmer. William Palmer was baptised on 25 Apr 1678. He married Grace Minor. George Palmer was baptised on 29 May 1681. He died on 8 May 1728 in Stonington. He married Hannah Palmer. Mary Palmer was baptised on 8 Jun 1690. She married Joseph Palmer. Rebecca Palmer was baptised by Rev. James Noyes on 1 Jul 1694 in Stonington. [Ref][Ref] She died on 22 Mar 1726 in Coventry, Tolland, Connecticu. [Ref, p. 67] She married Benjamin Palmer. [Ref, p. 67] Rebecca and Benjamin were first cousins once removed. Joseph Palmer was born on 14 Mar 1690 . He was baptised by Rev. James Noyes on 29 Mar 1691 in Stonington. [Ref] He died on 12 Jun 1789 in Voluntown. He married first Mary Palmer. He married second Hannah Billings. Hannah Palmer was born on 31 May 1694 in Stonington. She was baptised by Rev. James Noyes on 12 Aug 1694 in Stonington. She married first George Palmer. She married second William York. Sarah Palmer was born on 28 Apr 1698 [Ref][Ref, p. 41, says 3 Apr] in Stonington. [Ref] She was baptised by Rev. James Noyes on 19 Jun 1698 in Stonington. [Ref] She appears to have died between 9 Jan 1709/10, when her father wrote his will, and 13 Jun 1709/10, when she is not mentioned at the time of inventory. [Ref] There is a Stonington birth record [Ref] for Sarah, daughter of Joseph, for 25 Jan 1710. It seems likely that this is an error and Sarah died on 25 Jan 1710. 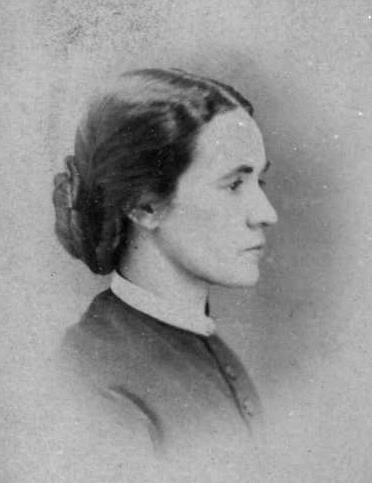 Lucy Palmer was baptised by Rev. James Noyes on 28 May 1699 in Stonington. [Ref][Ref]. She died on 2 Mar 1736/7 [Ref, says 28 Mar] in Stonington. [Ref, p. 82] She married William Chesebrough on 18 Sep 1720 [Ref][Ref, p. 82] in Stonington. [Ref] William, the son of Samuel and Mary (Ingraham) Chesebrough was born on 27 Aug 1693 and died on 23 Feb 1736/7. [Ref][Ref, p. 82 says he was the son of William and Mary (McDowell) Chesbrough, born on 1 Feb 1701] Lucy, William and their son William [?] died about the same time of the "Long Fever". [Ref] "Long fever" was a name for typhoid. Lieut. Ichabod Palmer was born on 25 Oct 1702 in Stonington. He was baptised on 10 Jan 1703. He died on 9 Nov 1749 in Stonington. He married Elizabeth Sanford Noyes. Prudence Palmer was born on 29 May 1706 in Stonington. [Ref] She was baptised by Rev. James Noyes on 29 Jul 1706 in Stonington . [Ref] She died on 22 Dec 1716. Her gravestone in the ancient cemetery in Stonington says: Here lyeth the body / of Prudence Daughter / of Ichaboad And / Hannah Palmer who / Dyed December / ye 22nd In ye 11th year of /Her age 1716. [Ref] Click here to see a photo on the Findagrave website. Capt. Joseph Palmer was born on 16 Aug 1717 in Stonington. He was baptised on 1 Sep 1717 in Stonington. He married Zipporah Billings. Mary Palmer was baptised by Rev. James Noyes on 8 Jun 1690 [Ref, p. 55] in Stonington. [Ref][Ref] She died on 13 Jan 1777 in Voluntown, [Ref, p. 66] at age 88. [Ref] She married Joseph Palmer on 2 Apr 1711 in Stonington. [Ref][Ref, p. 66, says 12 Apr] Joseph was her first cousin once removed. On 9 May 1716 William's father Gershom deeded land at Puckhunganuck to his son William. After William's decease, the land was to go to William's sons: Willam, Jr., Elihu and Wait. [Ref, p. 52] On 29 Dec 1719 William mortgaged this tract. [Ref, p. 52] In 1728/9 he assigned rights in two parcels of this land to his sons. William, Jr. and Wait later deeded these two parcels to Elihu. [Ref, p. 52] An 8 Oct 1729 deed states, "Whereas Deacon Gershom Palmer gave to his sons Ichabod, William, George and Walter certain parcels of land, and Ichabod had purchased his brother Walter's share for his own part, William, senior, made a quit-claim deed to his own sons, William, junior, Elihu of Westerley, Rhode Island, and Wait of Stonington; then, as George Palmer, in his will, had made his wife Hannah his executrix, with his sons Christopher and Joseph, at this same date they agree on a division." Children of William Palmer and Grace Minor. William Palmer was born on 1 Mar 1705 by Rev. James Noyes in Stonington. He was baptised on 27 Mar 1705. He died in 1831 in North Stonington. He married Abigail Wyatt. Phebe Palmer was born on and baptised on 24 Nov 1717 in Stonington. She married George Darrow. Elizabeth Palmer was born on 25 Mar 1728 [Ref, p. 84] in Stonington. [Ref] She married Unknown Avery. Col. Elias Sanford Palmer was born on 14 Mar 1742 in Stonington. He died on 6 Jun 1821 in Stonington. He married first Phebe Palmer 2. He married second Lucy (Randall) Breed. Phebe Palmer 2 was born on 3 Sep 1742 in Stonington. She died on 13 Sep 1793 in Stonington. She married Col. Elias Sanford Palmer. Gershom Palmer [Ref, p. 90][Ref][not in the Barbour records] was born about 1755. He died on 30 Apr 1831, age 76, [Ref] in Pendleton Hill. [Ref, p. 155] He and his wife are buried in the Palmer cemetery in North Stonington. [Ref] He married Zerviah Palmer on 1 Jan 1778 in Stonington. [Ref] She was his first cousin. Eunice Palmer [Ref, p. 90][Ref][not in the Barbour records] married Stuckley Palmer on 30 Jun 1780 in Stonington. [Ref][Ref, p. 155] Stuckley was her second cousin once removed. Sabra Palmer was born on 25 Apr 1767 [Ref, p. 90] in North Stonington. [Ref] She died in Jul 1850 in Lafayette, Onondaga, New York. [Ref] She married Rowland Palmer on 1 Jan 1792 in Stonington. [Ref][Ref] Rowland was her second cousin once removed. Grace Palmer was born on 4 July 1729 [Ref, p. 86] in Stonington. [Ref] She married Nathan Palmer on 6 Nov 1745 in Coventry, Tolland, Connecticut. [Ref] Nathan was both her third cousin and her first cousin once removed. William Palmer was born on 11 Sep 1731 in Stonington. He died between 10 Oct and 18 Nov 1801, probably in Brookfield, Madison, New York. He married Phebe Darrow. Maj. Gen. Noyes Elias Palmer was born on 20 Apr 1771 in Stonington. He died on 23 Apr 1858 in Panama, Chatauqua, New York. He married first Harriet Esther Palmer. He married second Hannah Rhodes Babcock. Rebecca Palmer was born on 26 Nov 1782 in Stonington. [Ref] She may have been alive and living with her father in 1790. Phebe Palmer was born on 3 Sep 1742 [Ref says 5 Sep][Ref, p. 141, says 5 Sep] in Stonington. [Ref] She died on 13 Sep 1793 in Stonington. [Ref][Ref, p. 141] She is buried in the Palmer cemetery in North Stonington. [Ref] She married Col. Elias Sanford Palmer on 15 Mar 1761 in Stonington. [Ref][Ref, p. 141] Elias was her second cousin (on her father's side) and third cousin (on her mother's side). William Palmer was born on 11 Sep 1731 in Stonington, New London, Connecticut. [Ref][Ref, p. 145] He died between 10 Oct and 18 Nov 1801, probably in Brookfield, Madison, New York. (At the time, Brookfield was part of Chenango county.) He married Phebe Darrow on 8 Nov 1753 in Stonington. [Ref][Ref, p. 145] Phebe was his third cousin once removed. Priscilla Palmer was born on 22 Jan 1757 in Stonington. [Ref][Ref, p. 145] She died on 1 Jan 1834 in Leonardsville in Brookfield. [Ref] She is buried in the Capt. Daniel Brown Cemetery in Brookfield. [Ref] She married Thomas Palmer. [Ref] Thomas was both Priscilla's third and fourth cousin. Frances Palmer was born on 6 Jan 1767 in Stonington. [Ref][Ref, p. 145] She must have died before 10 Oct 1801, when she was not mentioned in her father's will. Welthea Palmer [Ref, p. 145] probably died before 10 Oct 1801, when she was not mentioned in her father's will. Lucy Palmer was born on 23 Mar 1780 in Stonington. [Ref, p. 145] She died on 7 Mar 1862 in Lenox, Madison, New York. She married her fourth cousin once removed Joseph Palmer. Lucy was mentioned in her father's will. Maj. Gen. Noyes Elias Palmer was born on 20 Apr 1771 [Ref, p. 141] in Stonington, New London, Connecticut. [Ref][Ref] He died on 23 Apr 1858 [Ref, age 87 years, 47 [!] days] in Panama (in Harmony), Chatauqua, New York [Ref] and is buried in the Magnolia cemetery in Chautauqua [Ref, p. 28 says that he died 23 May 1858, age 87 years and three days]. He married first Harriet Esther Palmer on 20 Apr 1794. [Ref] She died on 25 May 1813 in Brookfield, Madison, New York. [Ref] She was twice his third cousin and once his fourth cousin once removed. He married second Hannah Rhodes Babcock. [Ref] Hannah, the wife of Noyes, died on 1 Feb 1857, age 72 years, nine months and 12 days [Ref], and is buried in the Magnolia cemetery. [Ref, p. 28] Click here to see a photo of Noyes' and Hannah's grave on the Findagrave website. Here is the information from the Centennial History of Chautauqua County Vol 1 page 417. A short explaination - of this entry. In 1902 a Centennial Celebration was held in Westfield, NY. Each Town had a display of historical and antique items. When this volume was published they included a list of the items displayed from each town and the name of person who loaned the item for display. Pages 415-418 are the Town of Harmony. Page 417 doners were Henry and Homer Pringle. Among the items listed were two commissions of Noyes Palmer. 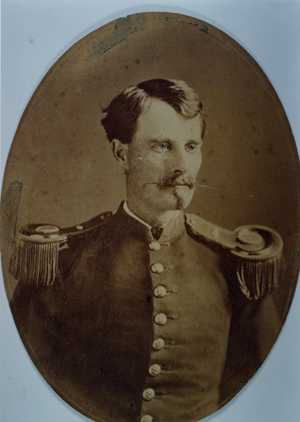 The first when he was commissioned as Major Colonel by Governor Tompkins. 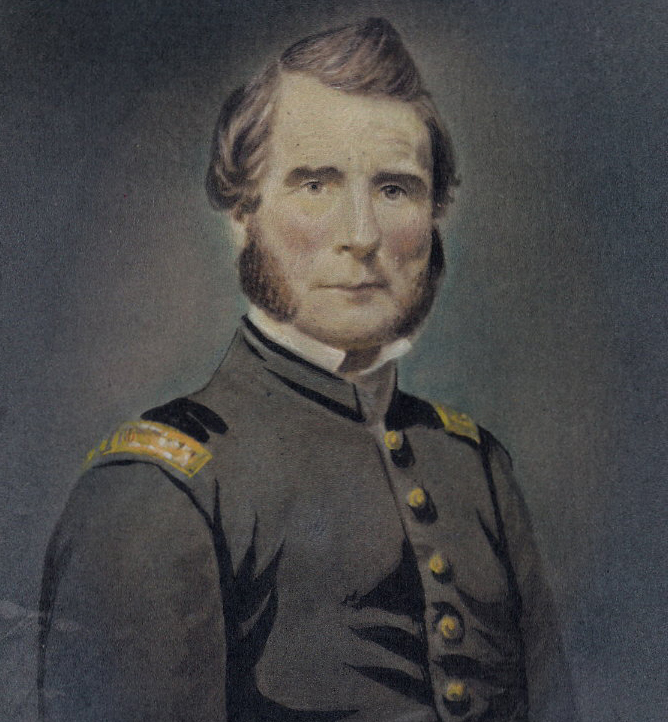 The second a commission as Major General by Gov. Clinton. Also a pair of top boots worn by Gen Noyes Palmer in 1820 and two silver spoons made from the hilt of a sword which belonged to Elias Palmer, a soldier of the Revolution, furnished by his great-grand children, H. N. Palmer and Mrs. H. Pringle. The spoons were made about the year of 1814. It is said that John was the son of John and Demaris (Crandall) Babcock. Harriet Palmer was born on 19 Nov 1802. [Ref] She died in 1819. Orisavilla Palmer was born on 14 Jun 1806. [Ref] Orrisavilla, the daughter of Noyes and Esther, died on 11 February 1878, age 71 years, nine months and 27 days, and is buried in the Magnolia cemetery in Chautauqua. [Ref, p. 28] Click here to see a photo of her grave. Capt. George Washington Palmer was born on 10 Jul 1810 in Brookfield. He died on 10 Jan 1889 in Monmouth. He married Amanda Malvina Harding. Priscilla Maria Palmer was born in 1812 [Ref] in New York. She died in Nov 1892. [Ref] Priscilla (Palmer) Brown, born 1819 [!] and died 1891 [! ], the wife of Charles W., is buried in the Panama Union Cemetery in Harmony, Chautauqua, New York. She married Charles Wesley Brown, the son of William and Polly (Coe) Brown, about 1845. [Ref] Charles was born about 1822 in Connecticut. Charles W. Brown, born in 1822 and died in 1888, is buried in the Panama Union Cemetery. Eugene Lycurgus Palmer was born on 5 Mar 1822 [Ref] in New York. He died on 16 May 1891. [Ref] He married Jane B. Unknown. Cornelius Palmer was born about 1824. Andrew Jackson Palmer was born on 12 Jun 1829 [Ref] in New York [Ref]. He died on 29 Mar 1897. 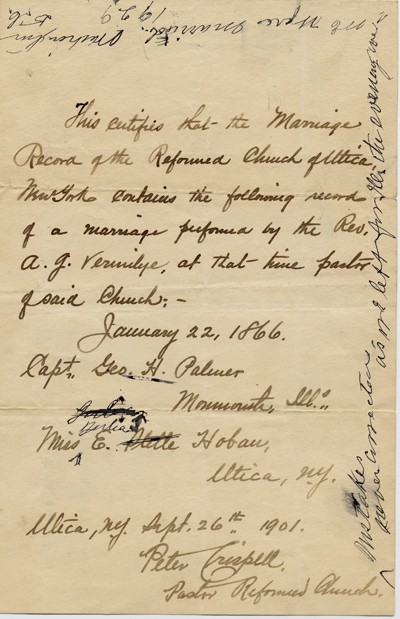 [Ref] He married Jane Pringle [Ref] on 4 Oct 1854 in Stedman, Chautauqua, New York. [Ref] Jane was born on 21 Mar 1828 in Richfield Springs, Otsego, New York. [Ref] She died on 27 Feb 1916 in Stedman. [Ref] Andrew and Jane are buried in the Magnolia cemetery in Chautauqua. [Ref, p. 28] Click here to see a photo of their grave. Rather unsatisfactorily, the only source I can find for the marriage of Noyes and Esther is the Walter Palmer Society. 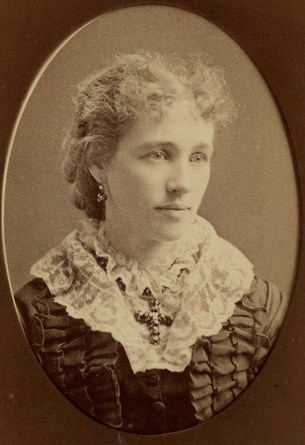 Caroline Palmer was born on 8 Jul 1834 in Bridgewater, Oneida, New York. [Ref] She died on 13 Aug 1884 in Stockton, San Joaquin, California. [Ref] She married George Henry Nye on 19 Mar 1857 in Monmouth. [Ref][transcriber's comment, Ref] George, the son of Elisha and Harriet (Henry) Nye, was born in Barnard, Windsor, Vermont on 23 Feb 1833 and died on 7 Jul 1901 in Chicago. [Ref] He is buried in the Forest Home Cemetery in Forest Park, Cook, Illinois. Click here to see a photo of his gra ve on the Findagrave website. 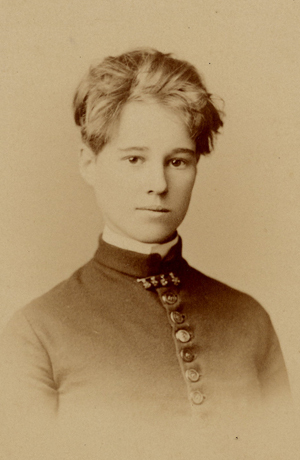 Sarah Jane Palmer was born on 5 Dec 1835 [Ref] in New York. [Ref] She died after 1920. 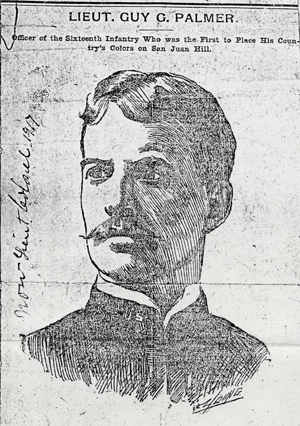 Maj. George Henry Palmer was born on 16 Apr 1841 in Leonardsville, Madison, New York. He died on 7 Apr 1907 in Washington, DC. He married Julia Estelle Hoban. 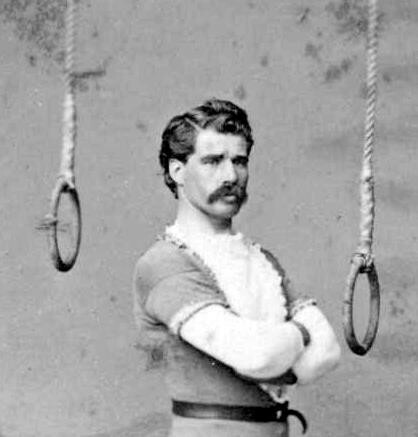 Charles Monroe Palmer was born on 12 Mar 1842 [Ref] in New York. He died after 1936, probably in Anderson, Shasta, California. It appears that he never married. On 8 Jan 1868 George wrote to Estelle, "'[Charley Dewey] wrote that Charly Palmer had been heard from and that he was still in Little Rock in some way connected with the Board of Registration." Harmon Clark Palmer was born on 9 Sep 1854 in Illinois. 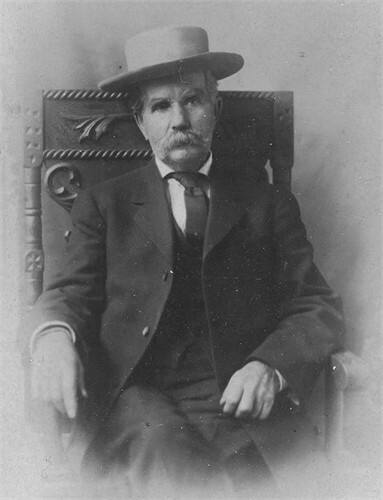 [Ref] He died on 10 Aug 1897 in Stockton, San Joaquin, California. [Ref] He married Annie Wetzel. David A. 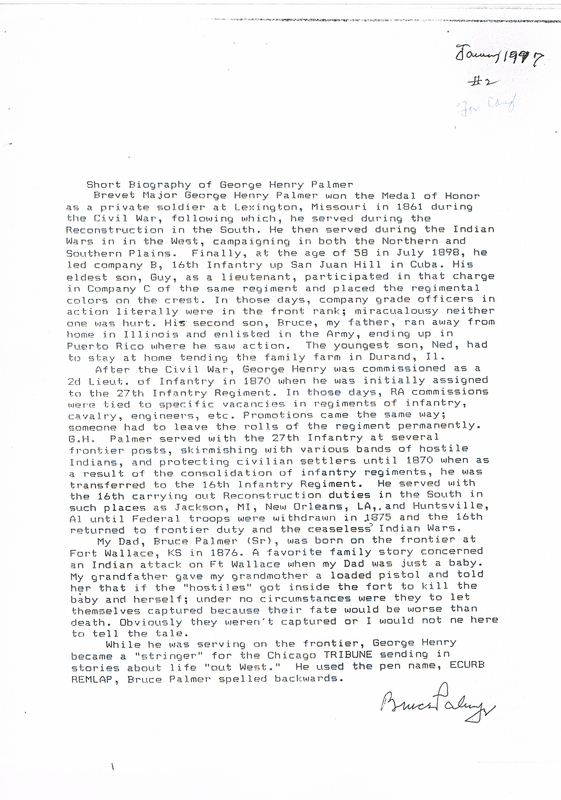 Luff has transcribed George's journal, it can be viewed on his web page. Estelle was born on 25 Dec 1841 in Clairmorris, co. Mayo, Ireland. [Ref][Ref says Dec 1842 in Ireland] She died on 1 Nov 1933. [Ref] She had a sister named Bridget. [Ref] It is said that Bridget was born in County Roscommen (which borders co. Mayo), that she died at age 38 in Utica and married Joseph Nevin, who was born in Country Clare in 1799. It is also said that Estelle had a sister Winifred. Estelle Palmer [Ref] presumably died young. Ruth Palmer was born on 25 Jul 1872 in [Davidson?] Tennessee. [Ref says that she was seven in 1880 and born in Tennessee.] Her father recorded her birth in his journal as "Ruth born July 25th 72". She died on 19 Aug 1949 at Fort Brooke, San Juan, Puerto Rico. [Ref] She is buried with her parents in Arlington Cemetery. [Ref][Ref][Ref She married Col. Edward Carey in Aug 1895 at Fort Douglas, near Salt Lake City, Utah. [Ref][Ref]. They divorced between 1910 and 1915, when her husband remarried.